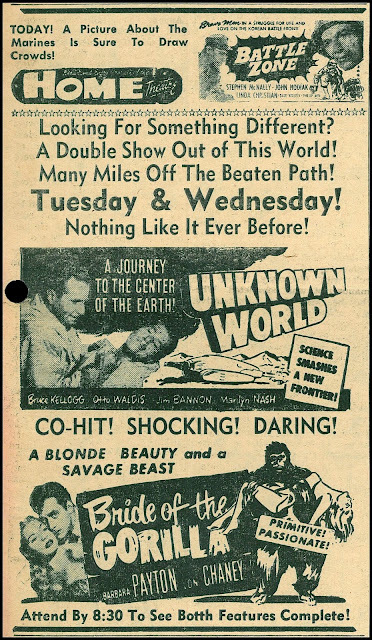 This third entry in Tom Weaver's "Scripts From The Crypt" series (previous two being The Hideous Sun Demon and The Indestructible Man), delves deep into 1951's Bride Of The Gorilla, a Realart jungle horror you'd not dream would inspire a book, let alone one so irresistible as what genre historian Weaver turns master hand to. He's gathered a blue ribbon panel of experts to flavor behind-scenes telling of a misbegot chiller sold variously as Shocking, Daring, Primitive, and Passionate (to each please add exclamation points, as does ad at left). Any chapter of this book would merit purchase price, and there are over a dozen of them. I attended weekend-long wedding festivities to accompany of GF Ann plus Bride Of The Gorilla, the book enjoyed during hotel bar sequesters fueled by whiskey sours and passages shared with Ann (her intro to sordid details of the Barbara Payton-Franchot Tone-Tom Neal dustup). Fellow tipplers noting the book's lurid cover and my rapt absorption (w/frequent recites) must have wondered what group home I had escaped from. Here are B Of The G highlights and reasons GPS readership will savor this book: 1 --- an intro by John Landis, ace director and lifelong chill enthusiast ... 2 --- Interviews as only Tom Weaver can conduct them, w/ eye-witness accounts of the film's production, as well as Weaver's close analysis re the latter, his history of Realart, producing Broder brothers, appreciation of Herman Cohen (getting his start here), and 3 --- dissect of once-in-a-lifetime cast Barbara Payton, Lon Chaney, Raymond Burr, Tom Conway, plus gorilla suitors and pulse-quickening F. Tone v. T. Neal. 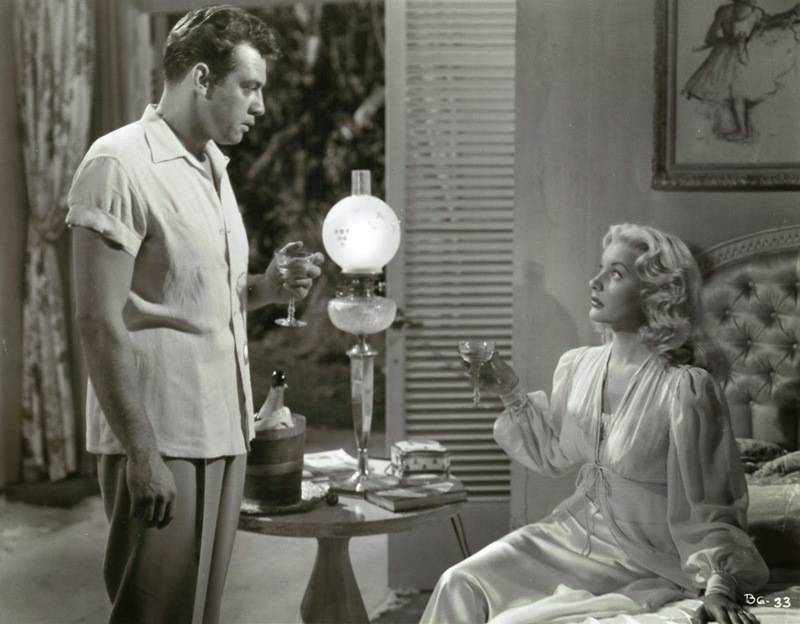 To this add Scott MacQueen's years-later visit with Bride director Curt Siodmak, covered in fascinating detail (with photos). There's "Fun Facts" from Weaver throughout, he and Greg Mank topping themselves with a "Lon Chaney Jr. Timeline" that left me agape over reams of revelation (and me thinking all this time that I knew my Chaney). If you care at all about horror legends, backstage peeps, underbelly probe, interviewee candor served raw (Weaver sure knows how to peel back scabs of memory), all making pages turn sans pause (you'll curse meals and sleep for time they take from this). Weaver's Scripts/Crypt series is a winning concept, with each setting a new bar. I'm panting already for the author's next. Thanks for the recent post about Tom Weaver's latest ingenious scheme for marketing stuff to us (well, not necessarily including you, but I'm in the zone) aging monster "kids". 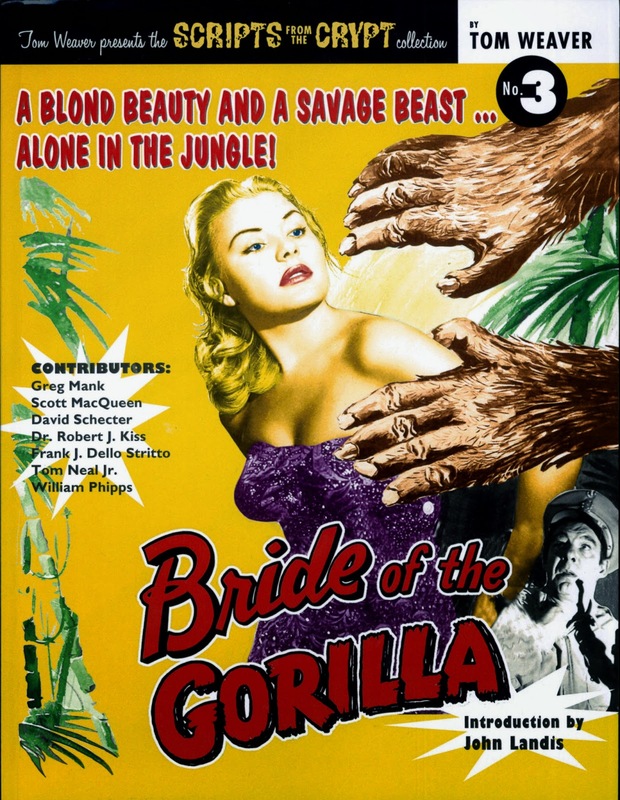 "Bride of the Gorilla"! Good lord---you ain't kiddin' with the 'once-in-a-lifetime' cast, if the criterion is bizarre-as-humanly-possible. I just recently looked at Universal's extremely slick and immaculate (albeit a tad dark to suit me, but not a deal breaker) Blu-ray of "The Wolf Man". That was Chaney Jr. ca. age 35. Beefy and meaty, but still clearly a youthful guy. What amazes me though is to look at the stills you've posted from "Bride of the Gorilla" (talk about a title that's not trying to hide its intentions) and see the wear and tear on Chaney in the space of the ensuing ten years. THIS is a 45 year old man? Wow. Certainly advertises the healthful effects of smoking and heavy drinking. But, you know, as far as that's concerned, the real wonder man of the movies was surely John Wayne, who was no slouch as a drinker and was also a chain smoker. They got him in the end, but the thing is that the public never minded in the least the collateral damage those notoriously-popular 'substances' did him. I think he was almost unique in respect to his unusual looks, which were handsome and appealing but in no way conventional. Pretty boy Tyrone Power was already starting to fade in that particular well before he died at the appallingly-young age of 44. Wayne was just getting started at 44! Chaney however did NOT benefit from the coarsening effects of his unfortunate elective recreation of getting bombed daily, plus smoking. I think either you or perhaps Ernie Farino it was who told me you met Lon Jr. I definitely did, at a 'Count Dracula Society' event in 1965 in Hollywood. (Had to buy a ticket in advance to attend!) I was thrilled pink to meet the living Wolf Man, but also paradoxically fascinated as part of me 'stood back' and observed this massive guy with puffy, bloated features and pale skin, plus a never-before-seen pair of eyeglasses, quietly and patiently signing proffered scraps of paper and photos and what-not. I'd brought along my youthful sketchbook in which I had a page decorated with my sketch of Chaney as the Wolf Man, and I remember he paid me a compliment in that famous deep voice, something along the lines of "that's a damn good sketch", or whatever it was. (I guess it was for a 12-year old!) He signed his name, only, in a very even hand---beautiful penmanship, really. I've since seen an actual autograph of his dad's owned by mega-successful makeup maven Greg Nicotero (of KNB), and it's uncanny how closely it resembles his son's handwriting, with a similarly even and immaculate penmanship. Chaney's rather cruelly described by British know-it-all Kim Newman (with his undertaker's suit, as usual) as not the sharpest knife in the drawer type of thing, in an 'extra' featurette about Chaney Jr. otherwise charitably called "Pure in Heart". I don't know about that! I've seen archival interview stuff with Chaney Jr. in which he is extremely articulate and forthcoming about his dad and other matters. But I also remember reading Evelyn Ankers's stories about Lon Jr. hazing her, and baiting her handsome-Harry boyfriend at the time, Richard Denning. Apparently Chaney Jr. needled Denning during a visit to the set, in which Denning was decked out in his uniform (I forget which branch of the services), and Denning was pissed off considering Lon Jr. wasn't risking anything much except his skin to spirit gum in the opening year of WW2 (as far as the U.S. role in it.) And I think somebody threw some ice cream at The Wolf Man! Stories like this just seem surreal. Imagine Chaney Jr. sitting there in full Wolf Man regalia and hair, wising-off to Denning in his sailor suit or whatever the hell it was. Almost impossible to imagine. "Bride of the Gorilla" had a once-in-a-lifetime cast, but they might all have been doubles, given the marked differences between those who appeared on the marquee and those who appeared before the camera. 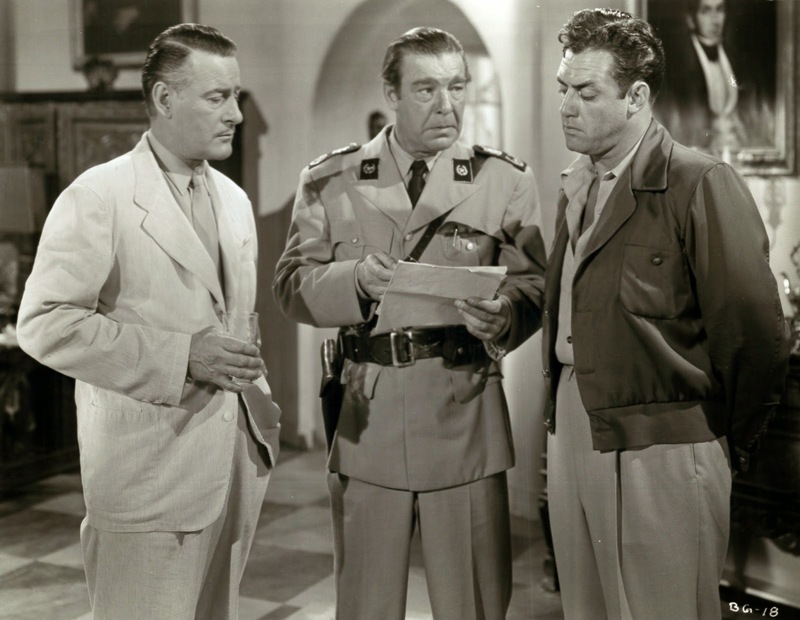 There was Raymond Burr, the one-time heavy and would-be leading man, with a personal life hidden behind the façade of a story so insubstantial that it couldn't have borne a moment's scrutiny, had anyone cared to look. I wonder if "Confidential" ever inquired about Burr' s late wife and child, or who he was mourning their deaths with? Lon Chaney had been a star for Universal in horror films and the "Inner Sanctum" series, but he was free-lancing now and drinking steadily. There would be a well-received character turn in "High Noon," but most of the other work he did was like "Bride of the Gorilla," just a job to get him a little further down the road. Barbara Payton had slept her way into a couple of choice roles and a marriage to Franchot Tone, but her own drinking and unsavory personal life made her unreliable in the eyes of the studios, while Tone eventually realized that there was an immutable clay to her Galatea. She preferred getting drunk with Tom Neal to reading poetry with Tone. Already her face was beginning to show the bloat that would be increasingly hard to disguise. All of them had names that could be exploited in a cheap picture like "Bride of the Gorilla," but even the tarnished glamour associated with their celebrity was in conflict with the lives they were living. As in Poe's story " William Wilson," the public and private lives of Chaney and Payton could not co-exist and both would be destroyed. Burr, however, found escape in a successful television series, " Perry Mason," transmuting the lively style and 1940's movie star looks of his appearance in the initial season into an increasingly stolid and inscrutable thinking machine, but in the process becoming more and more popular with every succeeding year. No one looked too closely into his personal life, no more than there was any need to know what was going on in Perry Mason's mind. The denouement or confession was left for the last five minutes of each episode, and to others. For Burr, there was no need. He had become his double.